0	0	Boundless	In Stock - Order before 4pm for same day dispatchWant it on Wednesday 24 April? What if life wasn't limited by fear? What you were meant for more? What happens when you let God in? Want a life full to overflowing with what God want for you? Christ came to offer us so much more than we can ask or understand.The purpose of this book is to recalibrate our sights, to help us to glimpse the size of salvation. Danielle urges us to live life to the full by opening ourselves up to the love of Christ. Arguing that 'sin makes everything small', she illustrates with reference to her own experience and current ministry the difference that Christ makes to your sense of identify and the way you see life. A former drug user, a triathlete and fearless evangelist, Danielle's infectious enthusiasm is a potent example of her message. 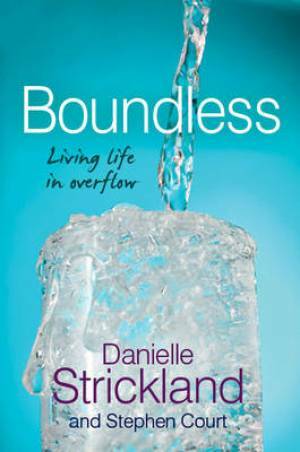 Boundless by Danielle Strickland; Stephen Court was published by Lion Hudson in March 2013 and is our 12982nd best seller. The ISBN for Boundless is 9780857214515. Here we have a super little volume packed with fresh, creative and engaging faith. The likes of which rarely comes along, and is also worthy of your confidence for the neighbour, friend or colleague who isn't yet persuaded by Jesus. Strickland and Court write comprehensively with generous and faithful insight. Life, scripture and playfulness are entwined. They work with the original languages to dig deep and ask fresh questions of our faithful God. As is recorded midway:- "Jesus barges in on karma with grace. He offers us new life." There's no pretending this book is a main course but it is winsome and wise, leaving the reader with a hunger for Jesus. Strickland and Court offer us a brilliant little volume. I think that the appearance, font, styling and look of the book is offputting: a relic of the tasteless 1980s! Oh that Lion Hudson had done better on this. I'll courageously honour the content and imagine there was better packaging, for Strickland and Court offer us the loving giver of true life and that's priceless. Take a peek at some articles related to Boundless. Got a question? No problem! Just click here to ask us about Boundless.